Scientists have questions, tech giants have data. No matter what your mother tells you about your smartphone frying your brain, there’s not a lot of solid scientific research on what smartphones do to the adolescent brain. Evidence that smartphone use, especially social media, is correlated with signs of depression often sounds reasonable — but lacks scientific rigor. That’s because many times, the studies are based on large surveys in which teens answer questions about their lives that may be vague or poorly defined. To get to the bottom of things, some researchers have set their eyes on the treasure trove that is Google and Apple’s data stores about how people use Android and iOS devices, according to Vox. There are two main problems with trying to understanding how smartphones affect brains. First, internet trends change rapidly, with apps rapidly falling in and out of fashion. Given that each of these apps, from TikTok to Fortnite, allow people to interact in different ways, it’s hard to come up with a universal explanation for how they impact people. Second, it’s hard to get the right answers to even the best questions. Often, the surveys that have informed past studies lumped together all smartphone use. Google has already agreed to share its data about how adolescents user their smartphones — with both participant and parent permission — with the Adolescent Brain Cognitive Development (ABCD) Study, but Apple hasn’t yet signed off on it. 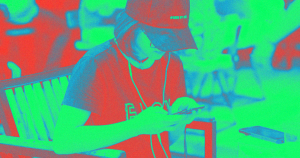 With information from the two tech giants, scientists can better understand how teens use smartphones. The researchers would be able to discover whether kids are using their phones to socialize and whether social media is actually correlated with signs of depression, as anecdotal evidence often suggests. “Naturally, we can’t actually do a pure experimental study where some children grow up with social media, some don’t,” Oxford Internet Institute psychologist Amy Orben told Vox. “Because, if not, we’re just going to have this debate without any evidence involved,” she said. More on smartphones: I Tried Apple’s Screen Time Tool. The Results Were Not Heartening.